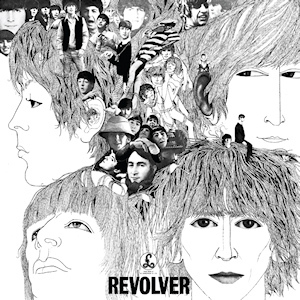 I’ve spent the past week with The Beatles’ 1966 album “Revolver“, listening for what I take away from this album as a songwriter to improve my craft? I went in and out of feeling underwhelmed by the album, but there were some songs that I particularly enjoyed. For me, this is not one of the Beatles better albums. Sure, some tracks are great with very good songwriting. But musically, some of the songs seem rather thin on ideas and I got tired of them after a few days. The first song provides a good example. The opener “Taxman” starts with a lead-in count, “1. 2. 3. 4.”, appropriate given the often rough raw feel of the album. The complaints about tax collectors, “if you take a walk, I’ll tax your feet”, is not particularly interesting to me. The song reminds me of The Fall with its repetitive punk sound, but lacks the colorful attitude of Mark E. Smith. In contrast, sophisticated-sounding strings provide the only accompaniment in the second track “Eleanor Rigby“. This contrast between songs keeps the whole engaging. My favorite track, “For No One” features some particularly good songwriting. Engaging imagery draws the tale of a relationship’s end. There’s some exposition, but there’s a delicate subtlety in the telling; This is why it’s so heartbreaking. In addition, the lyrics utilize an unusual second-person perspective to put the listener in the story. A sense of detached going through the process of a breakup runs through the lyrics and it’s emphasized by the rhythm of the piano and vocals during the verses. They read like “step 1.. step 2..”. I particularly enjoy the faraway sound of the piano. This combined with the french horn solo creates a poignant atmosphere of nostalgia that is suits the lyric perfectly. Some days I could not stop listening to this one. It’s followed by the fairly fun romp “Doctor Robert”, but I often found I skipped it like “Taxman”. I think it could do with a few less “Doctor Robert”s. I also love the fuzz guitar and rambunctious drums in “She Said She Said”. An annoying high-pitched note plays on the organ through much of the song like tinnitus. Thankfully a song this good can withstand the attempts of one instrument to ruin it. Reversed drums add an almost-but-not-quite psychedelic feel as well as contribute to the forward motion of the song. It’s interesting that different sections of the song have similar accompaniment but different vocals.. and then some sections have much different accompaniment. Overall, I think there are some interesting tracks on this album that are well worth a songwriter’s time to study. There’s several weaker tracks. Even though “Yellow Submarine” has a playful childish quality that makes it fun, it also makes it so that after a few listens I’ve had enough. This week I’ve listened to the 1967 album by The Beatles, “Sgt. Pepper’s Lonely Hearts Club Band“. I’ve noticed how simple many of the instruments’ individual parts are. A lead guitar will appear, play a few notes, and then disappear for a few bars; While underneath there may be this constant bed of chords played rhythmically on the piano, almost as if some krautrock or Velvet Underground is being played on a radio in the other room. I was reminded frequently by this album of the importance of letting an instrument rest. Also, of how the bass line can be provide interest. In contrast to most rock music, the bass guitar frequently provides melodic counterpoint. Even though much of the individual parts are simple, the accompaniment is made interesting by the way they are layered. They’ve pieced together something fairly complex from mostly simple elements. Ultimately, it became apparent to me the real focus of these songs, musically. The melodies drive every songs. Most of the rest serves to support the vocals. “Within You Without You” is the only track I do not like. I appreciate what Harrison was doing, but it bores me quickly. Musically, the song sounds nice yet goes nowhere. Lyrically, the song sounds like a hippie neophyte getting excited about Hinduism and I just don’t think it holds up well. I skip the song every time and it improves the album on a whole. It’s not really a Beatles song and it doesn’t fit with the rest of the album; which is definitely something since there’s so much variety on the album otherwise. “A Day in the Life” is absolutely my favorite track. Some very simple instrumentation opens the song with a single acoustic guitar. Piano and bass soon join in. All of these are gently played, especially coming out of the noise and applause from “Sgt. Pepper’s Lonely Hearts Club Band (Reprise)”. Congas, shaker, and then the drum kit soon join. On top of this accompaniment, John sings beautifully at a relaxed pace. Each line of the lyrics are observational, but end with a sense of questions unanswered that makes the following line welcome. A vague thread of narrative holds these lines together, like old news footage re-filmed through the lens of Godard. Then the song transitions into McCartney’s section. I’ve always though the transition was too long and dramatic, but the jaunty mid-section makes it worth it. Lyrically, the play between the two sections is interesting. Lennon’s lines are observational of vague events in the outside world with a sense of distant helpless; McCartney’s are very personal events on a smaller scale with a sense of immediate urgency. And that contrast leads to further unanswered questions. The lyrics are descriptive while leaving room for the listener to drop in and find their own interpretations. This is completely a great song and provides much to learn for songwriters. Some call this the greatest album of all time. I can understand recognizing the importance of the album’s influence, but I wouldn’t go that call it the greatest. I wouldn’t even say it’s the Beatles’ best album, it’s certainly not my favorite. That honor would probably go to “Abbey Road”. There are some great songs on “Sgt. Pepper’s Lonely Hearts Club Band”, though. In addition to “A Day in the Life”, I also love “Lucy in the Sky with Diamonds”, “Fixing a Hole”, “When I’m 64”, and “Lovely Rita”. Good stuff. I present a new single release of Trip Gunn music: “The Deadliest Summer” with b-side “Dial Tone”, with a cover featuring artwork by 19th century French painter Eugène Boudin. It wasn’t intentional, but perhaps the September equinox is an appropriate time to share “The Deadliest Summer”. I wrote this song as “Orange Velvet Crush” in the fall of 2015. The final version differs little from that first draft. Most revisions to lyrics were just a matter of word-choice and rhythm, but the first two lines of the chorus were completely replaced. Originally they were “Times passes slowly, but it goes so fast; I held on to the trees and celebrities.” I disliked them when I wrote them, but I believe it’s better to write anything now and revise later than to wait for good stuff. The inspiration for the new lines came from a line of Henry Darger‘s book Crazy House; The book begins as a reality-based autobiography, but with the line “Oh yeah, there’s one thing I forgot to mention…”, Darger goes from reality to tales in his fantasy world instead. I appreciate that within the context of Henry Darger, but it also fit beautifully with the subject of this song. This is one of only three songs that I worked on with a band in 2016. We only had a few practice sessions before dealing with typical but annoying difficulties, including practice space issues and scheduling conflicts. At any rate, we played around with the chorus chord progression a bit, but I ended up going with the way I had written it. Either I didn’t heed good advice or it worked out in the end. Still, I finally got to use my Danelectro guitar on this one. Revery’s loose leaves dance past. For a b-side, I chose the song “Dial Tone”. While “The Deadliest Summer” is revisiting a time associated with a space, “Dial Tone” is caught in a specific time and place. I started with the chorus and took some time to get the verses. Then inspiration came from the line “in my bedroom in those ugly new houses” in The Smith’s song “Paint A Vulgar Picture“; Viewing the chorus through that line, I saw the whole scene. I spent time as a teenager at a brick house on second street in Athens OH. The song has nothing to do with my friends that lived there, but that house serves beautifully as the setting. Regardless, the song is certainly about a very teenage experience. I knew from the start how the melody for the chorus, but not the rest. So, I chose the key and based some of the chord progression on the dial tone for landline phones. Two sine waves combine to create the tone, one at middle-A and the other is very close to an F below the A. I avoided too obvious a use of a dial tone sound, but played with hints of it throughout. Cradles stars in its belly? A heartache waiting to be unburied? I created this simple lyric video for the song “Oliver”. The 19th century photograph of Belfield Hall used for the single cover provides the background. The song bears no relationship to Belfield Hall, though it fascinates me that this image captures a home that no longer exist. According to a post on ipernity.com, the buildings fell to demolition around 1916. The aristocratic hall was certainly nothing like Oliver’s house. I see Oliver in a small one or two bedroom house in the suburbs. “Marianne” was one of the earlier songs I wrote for Trip Gunn, with very little revision from the initial version. The music drives through Am until the coda. Elvis Costello had originally intended his song “Uncomplicated” to be single chord, but had ended up bringing other chord changes in for the chorus. This idea has always intrigued me, and because the vocals of this song were going to be a menacing rhythmic chant, I thought it’d be a good candidate. But then, I’d written the final verse that needed a change of tone and so it became the coda that’s us outside of the house to the street. The writing of “Oliver” began in the autumn of 2015 after being inspired by something Jarvis Cocker had said about the songwriting of Scott Walker. My idea was to write about some mundane person doing something completely unremarkable, but elevating that into something unusual. I started with the line “Oliver walks from one room to the next”, because what could be so unremarkable while still being an action? From there, the song pretty much wrote itself. That’s not all Oliver does. And the softest room in the house. Oliver walks from one room to the next. An noisier track “Sick of It” came out of a desire to write something more straight forward noise-rock feel. It’s obviously still very much electronic pop, but has a bit of a harsh edge with a cavern of fuzzy reverb that I find delicious. Work on this song started in March 2016 with lyrics for the chorus and the second verse. I woke up with the chorus stuck in my head and the title of “Your Call”. A few weeks later, the first verse was written and the title “Out of My Mind” from the new verse. I’m happy to finally share this as my first single as Trip Gunn. Hope to have even more tracks over the coming months. Thank you. Call you out or count you in. You have to try harder, a little harder than that. An instrumental track, “You Can Laugh If You Want,” was written to accompany “Out of My Mind.” It’s a simple piano piece with noises and stuff.